Over 330,000 individuals in the United States depend on hemodialysis (HD), the majority as a result of end-stage renal disease. Sustainable vascular access can be achieved through arteriovenous fistulas, arteriovenous grafts, or tunneled catheters. Tunneled dialysis catheters (TDCs) often remain in use for months or even years, long beyond their initial intended use as a bridging device. Research efforts are focused on identifying strategies to prevent/minimize the risk of the most common catheter-related complications: thrombotic occlusion and infection. Thrombotic occlusion of TDCs prevents adequate dialysis but can be managed successfully through thrombolytic agents to restore/improve blood flow in the majority of patients, allowing immediate HD delivery and prolonging usability of the TDC. Occasionally, catheter exchange with fibrin sheath disruption is needed to preserve the site. Surface-treated catheters could improve the morbidity and mortality associated with HD delivery via an indwelling catheter, but results from studies have been disappointing to date. We review the etiology of catheter-based access failure and the monitoring and interventional steps that should be taken to maintain the patency and safety of catheters for HD. Wherever possible we note the areas in which there is scant data where further randomized clinical trials are needed. Hemodialysis (HD) is a life-saving and life-sustaining procedure. In 2006, approximately 330,000 individuals in the United States were receiving HD (1). Sustainable vascular access providing high-volume blood flow rates (Qb) >300 ml/min is essential, either through permanent arteriovenous access or tunneled dialysis catheters (TDCs) (2). The majority of patients begin HD with a TDC (3). In the United States, 60 to 82% of incident HD patients start with a catheter (4,5). Up to 33% of patients in Canada are dialyzing with a long-term TDC (6). TDCs allow immediate vascular access, are initially almost always functional, require no venipunctures, rarely produce hemodynamic consequences, and do not require surgical placement (7). Despite efforts to limit their use, TDCs often remain in use for months or even years (8). Studies have shown that approximately 40% of patients had TDCs 90 days after commencing HD (5,9,10). Proper catheter management to preserve patency and to prevent/minimize the risk of infection is vital in improving patient outcomes (11). This article focuses on the first of these, reviewing the etiology of inadequate blood flow delivery and discussing the monitoring and interventional steps needed to maintain the patency and usability of HD catheters. The consequences of blood flow access dysfunction in HD can vary from inadequate dialysis dose delivery to increased mortality (1,12). Access dysfunction increases resource utilization and healthcare-cost burden (13,14). A retrospective analysis of resource use among 88 HD patients found that 51% experienced at least one access-related complication during follow-up (mean 487 days) (15). A follow-up of 674 patients from 22 chronic HD units showed a significant association between decreased dialysis adequacy and increased hospitalization because of complications (11%), number of hospital days (12%), and inpatient expenditure (US$940) (16). Of all accesses, TDCs produce the majority of problems related to delivering adequate blood flow for dialysis and require the most interventions (2,5). The 2006 National Kidney Foundation Kidney Dialysis Outcomes Quality Initiative (KDOQI) guidelines define access dysfunction as the inability to achieve Qb of ≥300 ml/min (2) during the first 60 minutes of HD despite at least one attempt to improve flow. Since then, larger bore catheter design allows much higher Qb (>400 ml/min) to be achieved at the same prepump pressure. Waiting until Qb declines to 300 ml/min in these catheters may be inappropriate, missing the opportunity to detect catheter dysfunction earlier. However, studies to support this hypothesis are needed. Early identification of catheter dysfunction enables prompt intervention and salvage. Catheter occlusion, a main cause of poor Qb, may be caused by kinking or malpositioning (17). In these cases, catheter dysfunction generally emerges during the first HD session and can be resolved by repositioning or, occasionally, replacing the catheter. In a previously well functioning long-term catheter, inadequate flow may result from a change in position of the catheter tip during that session and respond to simply placing the patient in a recumbent position or adjusting the patient's neck position. However, thrombotic occlusions, of which there are four major types (Table 1) are a more serious cause of access dysfunction. They occur in 30 to 40% of patients, can occur within 24 hours after insertion or after prolonged continuous successful usage (18), and can provide a substrate for bacterial growth (19). A study of 721 HD patients revealed that clot formation was one of four parameters, significantly (P < 0.001) and independently related to inadequate dialysis dose delivery (20). Injury to the vessel endothelium begins with insertion of the catheter and is augmented by turbulent flow around the catheter. “Line” reversal or catheter ”manipulation” as attempts to improve blood flow promote even more disruption in the fibrinolytic system, initiating the coagulation and inflammatory cascade (21). Minute irregularities on the catheter polymer surface permit platelet adhesion and activation of the intrinsic coagulation pathway (17). Silicone may have less throbogenic potential than other materials (22). It is the development of a fibrin sheath that determines the long term patency of a catheter. This sheath, initially composed of fibrinogen, albumin, lipoproteins, and coagulation factors, begins to form within 24 hours of insertion (23). The fibrin sheath attracts platelets and coagulation factors and promotes leukocyte adherence (21). Over weeks and months, collagen is deposited as smooth muscle cells from the venous vessel wall migrate toward the tip. The rate of these processes varies among patients because of inherited or acquired characteristics. Ultimately, if clotting in excess of the endogenous fibrinolytic system's capacity develops, catheter thrombosis occurs. Prompt identification of access dysfunction, a key goal of the KDOQI guidelines (24), enables appropriate intervention (pharmacologic or mechanical) before the emergence of access- and life-threatening complications. Prospective monitoring for catheter Qb dysfunction should be a routine part of the medical management of patients undergoing HD. Potentially dysfunctional catheters and reduction of Qb to “critical” levels can be detected before “emergency” problems arise through systematic monitoring of Qb and prepump negative arterial pressure (Pa) during HD. The catheter channel is a long tube whose diameter and length determine resistance to flow (25). There is a curvilinear relationship between pressure and flow; the prepump pressure is virtually a negative mirror of the venous pressure at Qb from 50 to 500 ml/min (Figure 1a). Most large-gauge catheters have a conductance (Qb/Pa) of 2 ml/min/mmHg. When examined serially over time at a prescribed Qb (e.g. 350 to 450 ml/min), increasing negative prepump pressure to achieve the prescribed flow reflects alterations in inlet orifice TDC function. (a) Relationship of prepump pressure (Pa) and venous return pressure (Pv) to blood pump flow. Note that the two curves are nearly mirror images of each other, although the negative Pa pressure has an absolute value slightly higher than Pv. The dashed lines shows the effect of orifice obstruction at either the inflow or outflow ports. The circles indicate the effect of “deliberate” clamping of the tubing to the arterial transducer to obviate machine alerts. Prepump pressure becomes independent of flow. 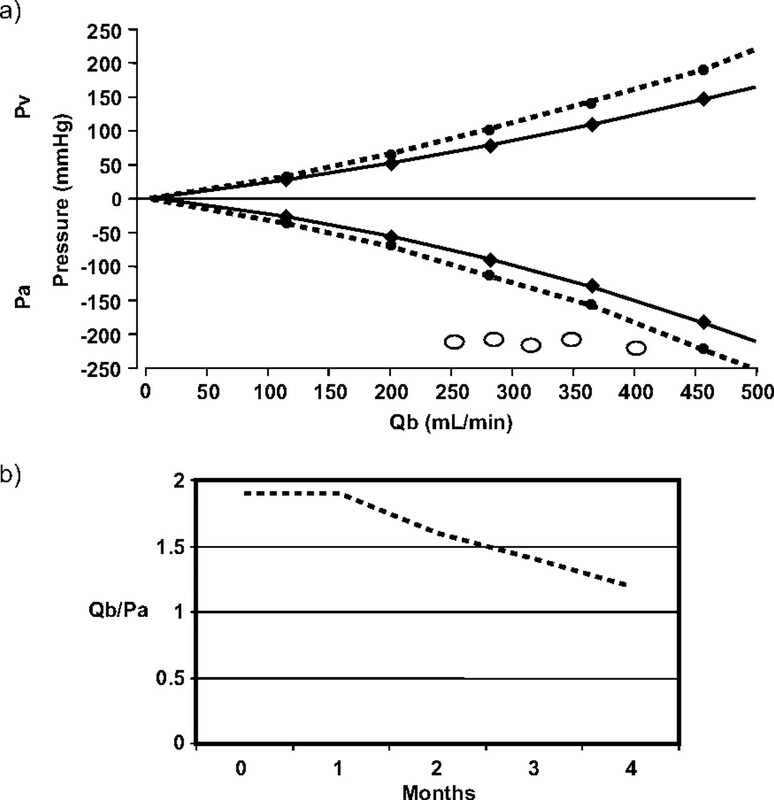 (b) Sequential measurements of pump flow (Qb) at the same prepump pressure early into dialysis. We recommend the measurement of Qb at a preset prepump pressure (e.g. −250 ± 10 mmHg at each HD session 5 minutes after the start of each HD session with trending over time. A Qb decline of <10% at the same negative prepump pressure may result from many factors, but a change >10%, particularly if progressive, i.e. lower conductance, suggests impending access dysfunction, which may warrant intervention (Figure 1b). Qb decline to <300 ml/min during the first and/or last 30 minutes of an HD session, delivered Kt/V of <1.2, Pa more negative than 250 mmHg, and venous pressure of >250 mmHg are other signs of dysfunction. Routine monitoring of these parameters with immediate alerts to physicians should be encouraged for all HD patients with a TDC. The standard procedure for maintaining patency between dialysis treatments has been heparin instillation (1000 to 10,000 U/ml) into the lumens in a volume sufficient to fill to the lumen tip (the lock). The heparin concentration used for locking has been reduced because catheter lumens have increased in volume so as to reduce the possibility of unintentional systemic anticoagulation of patients (26–29). Locking with lower heparin concentrations (2500 or 1000 U/ml) prevents catheter thrombosis as efficiently as 5000 U/ml (30,31). Heparin loss (“leak phenomenon”) through diffusion from the lumen within the first hour or after injecting the locking solution (slow versus fast) may accidentally administer up to half the anticoagulant systemically (27) and may explain reports of bleeding episodes after heparin lock (32,33). No catheter seems to be free of this problem. An in vitro study of five different double lumen catheters showed that systemic leakage was greatest with 20% overfill (34). The degree of systemic anticoagulation appears to be proportional to the dose of heparin instilled. In a small study in patients undergoing heparin-free dialysis, all patients with catheters and heparin locks at the end of dialysis had deranged clotting 1 hour after completion of dialysis. Heparinized saline, using a lower total dose of heparin per catheter lumen, significantly reduced this rate. A lower-concentration (1000 versus 10,000 U/ml) heparin lock was associated with a higher use of tissue plasminogen activator (tPA) (35). Citrate locks do not produce this apparent systemic effect (27,29,36). Currently there is great interest in trisodium citrate (TSC), given its antithrombotic and potential antibacterial properties (37). A study in 19 patients (1370 sessions) showed that a low-concentration 4% citrate lock was associated with a higher rate of catheter thrombosis than standard heparin but had no effect on dialysis efficiency, effective blood flow, the use of thrombolytic therapy, or safety (38). A subsequent double-blind, crossover study in 28 patients showed that a 5% citrate lock was just as efficacious as a 10% solution (39). Two prospective observational studies conducted in Canada (40,41) showed either equivalence or a lower rate of TDC exchange and tPA use without a change in hospitalization for TSC 4% versus heparin. The largest experience reported is that from Grudzinski et al. (42) during a conversion study from heparin 10,000 U/ml to 4% citrate locks. The rate of flow-related catheter exchange, tPA use, and bacteremia did not differ in the year of heparin locks compared with the subsequent year of citrate locks with over 30,000 catheter days at risk in each period. Unexpectedly, a higher concentration of TSC (47%) produced a significantly higher catheter thrombosis rate (measured by the use of a urokinase lock) versus standard heparin lock (43). The antimicrobial activity of TSC is concentration dependent (37), and higher concentrations would be desirable. However, there is concern over using higher-concentration TSC, and currently the Food and Drug Administration (FDA) restricts tricitrosol in the United States to <4% (44). Questions remain regarding the optimal locking frequency and dose of any agent to optimize catheter patency (45). The American Society of Diagnostic and Interventional Nephrology Clinical Practice Committee (46) recommends using a locking solution of 1000 U/ml heparin or 4% TSC to maintain TDC patency. The need for tPA for maintaining catheter patency may be increased by using 1000 U/ml heparin lock compared with higher heparin concentrations, but safety considerations mandate that higher concentrations of heparin lock be reserved for patients with evidence of catheter occlusion or thrombosis after 1000 U/ml heparin. Thrombus formation within or at the tip of an HD catheter can be resolved by catheter replacement alone, catheter replacement with balloon disruption of the fibrin sheath, or stripping of the fibrin sheath from a femoral vein approach (47). In a randomized clinical trial pilot study in 47 patients, 70% of whom had sheaths, disruption of the sheath compared with no disruption prolonged the median time till repeat dysfunction from 97 to 373 days, modestly increased mean blood flow, and produced a higher URR, 72% versus 66% (48). The choice of technique should be guided by factors including cost and patient and physician preference. Catheter replacement with sheath disruption is invasive, inconvenient, costly, and time consuming and increases patients' risk for additional complications, but in our opinion it produces more durable results. Prophylactic warfarin has shown some effect in reducing thrombus formation rates in patients with a TDC (49–51). The importance of adequate systemic anticoagulation (international normalized ratio, 1.5 to 2.0) is crucial (49). Malfunction-free catheter survival at 9 months was 47.1% in patients with adequate anticoagulation compared with 8.1% in patients without (P = 0.01). However, the risk of bleeding and the need for regular monitoring and possibly dose adjustment makes this a less than ideal therapy for routine use in HD (33). Moreover, use of warfarin in HD patients has become controversial, because warfarin may promote vascular calcification (52). Of the commonly available antiplatelet agents, neither acetylsalicylic acid or dipyrimadole have shown consistent efficacy in preventing TDC thrombosis. Clodiprogel has not been systematically studied. Noninvasive pharmacotherapy with lytics has proved to be effective in restoring catheter patency, and a number of lytic agents are currently available (53). However, there are no thrombolytic agents approved for the clearance of occluded TDCs. Use of lytics is on the basis of data of thrombus clearance found in other smaller central venous catheters. Safety issues with urokinase for this purpose led to its withdrawal in the United States in 1999 (54). Both the manufacturers and subsequently the FDA warned that streptokinase should not be used for thrombolytic clearance of indwelling catheters because of the risk of allergic reaction and the frequency of serious adverse events (55). By default tPA (alteplace) became the only approved agent for thrombus clearance of central venous catheters. A variety of protocols are used by dialysis centers to restore TDC blood flow. Frequently a lytic is used as an intradialytic dwell of 1 hour when the Qb achieved (<250 ml/min) would be unable to provide adequate dialysis even after moderate extension of treatment time. Two strategies attempt to improve Qb before development of an “emergency” TDC flow problem: so-called pre-emptive postdialysis lytic lock or intradialysis lytic infusions. There have been no comparative outcome studies of the various strategies. Short-term dwells should produce suboptimal results because diffusion of lytics to the site of occlusion (thrombus or fibrin sheath) is limited, yet a 1-hour dwell (repeated if the first instillation is unsuccessful) has been the most common protocol studied. In some protocols the lytic is slowly pushed in by injection of saline 0.2 ml/lumen every 10 to 15 minutes to advance the lytic to the catheter tip during the 1-hour dwell. This strategy decreased the need for repeat lytic dwells by 81% while maintaining the proportion of successful declottings (56). In all of these instances, lytic use is intermittent and conditioned by catheter performance at any moment in time. The use of lytics as locking solutions between all dialysis sessions has been recommended by Gabutti et al. (57). Postdialysis lock with urokinase versus conventional heparin (5000 U/lumen) was associated with increased Qb and reduced occurrence of dysfunction. If maximizing flow is the key issue, then the study of Twardowski (58) has particular relevance; Twardowski's study sought to minimize the occurrence of inadequate Qb (<400 ml/min during any dialysis session). Locking the catheter with 5000 to 9000 U of urokinase between treatments was successful in restoring flow in only three of 21 instances, whereas infusion of 20,000 to 40,000 U of urokinase into the catheter restored function in 10 of 25 instances. Even when there was an inability to aspirate from the catheter at all, infusion rather than locking was successful in restoring the ability to dialyze with adequate blood flow in eight of nine patients. Twardowski suggested a “prophylactic” strategy for lytics. Whenever a nonpositional progressive deterioration of blood flow was noted, 250,000 U of urokinase was infused during dialysis over 3 hours, if there were no contraindications. Successful full restoration of Qb (>400 ml/min) was achieved in 132 of 162 (81%) instances. In those failing to achieve the desired Qb, repeat infusions increased the success rate. Whether the increased cost of intradialytic high-dose urokinase could be offset by the high probability of positive results, saving on transportation expenses and nursing and patient time, and avoidance of catheter stripping or catheter exchange was not formally studied. The remaining discussion will focus on the recombinant tPA alteplase, reteplase, and tenecteplase (an emerging thrombolytic agent). Two studies have demonstrated efficacy for alteplase 1 mg/ml instillation in restoring the patency of occluded HD catheters (59,60). A single instillation of low-dose alteplase with a 30-minute dwell restored or maintained Qb >300 without line reversals in 36 of 50 (72%) patients, with a second instillation restoring patency for a further four patients (40 of 50 patients; 80%) (59). The majority of patients (70%) required additional intervention within the 4-month follow-up of further alteplase instillation (62%; median time to next exposure 14 days) and/or radiologic intervention (59). The financial savings over replacement of dysfunctional catheters in these 50 patients was estimated at approximately 22,000 Canadian dollars. In the second study, Qb of >300 ml/min was completely restored in 23 of 62 (37%) episodes of low Qb (<250 ml/min; mean pretreatment Qb, 130 ml/min; and mean post-treatment Qb, 320 ml/min) (60). Partial improvement (mean pre- to post-treatment Qb from 69 to 233 ml/min) was restored for 20 of 62 episodes. Clearly the degree of flow restoration varied inversely with the pretreatment blood flow. Nineteen episodes failing to respond to alteplase installation therapy were shown to have malposition or sheath formation (60). Neither low-dose study systematically collected safety data. In two other studies, a single instillation of a higher dose (2 mg/ml) restored Qb to ≥200 ml/min in 15 of 18 episodes (83%; mean post-treatment Qb, 260 ml/min) (61) and in 49 of 56 episodes (88%; mean post-treatment Qb, 248 ml/min) among 22 patients (62). The mean flow rate in both of these studies would be regarded as dysfunctional using current guidelines (2), reflecting the previous tendency to delay thrombolytic therapy until the dysfunctional process was very advanced. Studies have shown alteplase more effective than urokinase in restoring flow to occluded HD catheters (62,63). Single dwell instillation (up to 60 minutes) of low-dose (1 mg/ml) alteplase led to significantly more patients achieving Qb >300 ml/min than with urokinase (5000 U/ml) (70% versus 35%; P = 0.013) and completing an HD session (93% versus 70%; P = 0.023) (63). The mean post-treatment Qb was 291 ml/min in the alteplase group and 203 ml/min in the urokinase group. Using a 30-minute push protocol, alteplase restored Qb (>200 ml/min) in 92% of partially occluded catheters (mean post-treatment Qb 260 ml/min) and 85% of completely occluded catheters (mean post-treatment Qb 246 ml/min) (64). An analysis of 14 patients who had previously received urokinase for catheter occlusion revealed that alteplase was significantly more likely to partially restore the flow (Qb >200 ml/min) of completely occluded catheters, 88.2% versus 42.8% (64). Optimal dwell times for lytics have yet to be formally defined. Indeed, both short (1 hour) and long (>48 hours) dwell times preserved catheter patency for the subsequent HD session; patency was preserved for a mean of 14 days with both protocols (65). The long-term patency rate after alteplase instillation remains to be determined. In a 36-month follow-up of 570 HD catheters, the overall catheter half-life was 10.2 months, the median time from first to second alteplase instillation was 27 days, and the period from second to subsequent instillations was 10 to 18 days (66). Alteplase infusion protocols also successfully restore HD catheter flow, even when associated with fibrin sheaths (67,68). Administration of alteplase 2.5 mg per port over 3 hours resulted in a 91% success rate (effortless aspiration and infusion capability through both lumens) for the subsequent HD session, but primary patency rates were relatively short (68). Infusion of alteplase 2.5 mg/h/port over 2 hours (total dose 10 mg) restored flow to >250 ml/min in all 25 patients presenting with poorly functioning HD catheters; catheters remained patent to 30 days in 54% of patients and to 45 days in 33% of patients (67). Reteplase has demonstrated similar efficacy in restoring the flow of occluded HD catheters in two retrospective analyses (69,70). Reteplase (0.4 U/lumen; dwell time, 30 minutes) restored/improved Qb in 44 of 50 patients (69); 50 of 59 patients were able to complete HD in another study (70). These published studies of thrombolytics for the treatment of HD catheter flow dysfunction have been limited by small numbers of patients, differing dosing regimens, lack of control data, and inconsistent definitions of treatment success (71), with success often defined as flow rates that would be considered as dysfunctional according to the current KDOQI guidelines (2,24). More recent studies with tenecteplase, which has increased fibrin specificity, greater resistance to plasminogen activator inhibitor-1, and a longer half-life, have adopted more rigorous definitions of treatment success (72,73). Tenecteplase was evaluated in two large pivotal studies: TROPICS (Tenecteplase for the Restoration of Function in Dysfunctional HD Catheters) 3 (72) and 4 (73). In both trials, the KDOQI Qb criteria of <300 ml/min and a flow of ≥25 ml/min less than prescribed were used for inclusion. Acute therapy as well as extended interdialytic dwell were evaluated on TDC delivered blood flow in both studies. The primary efficacy end point was defined as Qb ≥300 ml/min and an absolute increase of ≥25 ml/min from baseline after the 1 hour lytic dwell that persisted at 30 minutes before and at the end of HD. If both of the above criteria were not achieved, open label tenecteplase, given as an extended intradialytic dwell period (up to 72 hours), was evaluated. An overnight extended dwell was more effective in restoring adequate flow (>300 ml/min) than the short dwells. Overall treatment success (Qb of >300 ml/min and increase by 25 ml/min) was achieved in 22% of patients after single 1-hour dwell (no extended dwell; TROPICS 3), 40% when the initial 1-hour dwell was followed by extended dwell in TROPICS 3, and 49% when the initial dwell was followed by an interdialytic dwell in TROPICS 4. Five studies suggest that use of tPA as a catheter lock solution may effectively reduce the risk of vessel occlusion between HD sessions with no increased risk for bleeding events (74–76). In a prospective, double-blind study of alteplase versus heparin among nine children, alteplase 1 mg/ml between HD sessions significantly reduced the risk for clot formation (P = 0.001) (76). In the following year, using interdialytic tPA locks, a significant reduction in both the incidence of blocked lines requiring tPA infusion (P < 0.03) and the need for surgical replacement (P < 0.02) was observed. In a separate study, a 2-mg tPA locking solution preserved catheter performance between HD sessions in 10 patients undergoing HD (75). Further evaluation of lytic locking solutions is warranted. An observational study evaluated reteplase as an interdialytic lock solution (77). The mean ± SD duration of catheter patency was 45 ± 39 days. Among 85 episodes of catheter dysfunction, higher reteplase doses (4 to 6 U versus 1 U) were associated with a higher but not statistically significant rate of restored catheter function (91% versus 84%, respectively). For patients with Qb <250 ml/min, acute lytic therapy offers a short-term solution to restore indwelling catheter patency and allows a window of opportunity to implement alternative HD delivery access (66), emphasizing the need to monitor patients to detect early signs of occlusive dysfunction. Studies are needed in this setting to determine the benefits, with regard to long-term catheter patency, of early lytic intervention on an individual basis using, for example, percentage changes in Qb between HD sessions rather than a defined Qb to trigger therapy. Clinical studies are also needed to determine the relative merits of the various approaches to lytic therapy, particularly the value of prophylactic therapy using an interdialytic locking solution between HD sessions for prolonging catheter patency. The PreCLOT (Prevention of Catheter Lumen Occlusion with tPA versus heparin) study may help answer this question (78). Patients will be randomized to tPA 1 mg per lumen once per week, with 5000 U/ml heparin as a catheter-locking solution for the remaining two sessions or to the control arm receiving 5000 U/ml heparin as a catheter-locking solution after each dialysis session. The primary outcome is catheter malfunction on the basis of mean blood flow parameters while on HD, and a cost-effectiveness analysis is planned with catheter maintenance using once weekly tPA versus heparin locking solution. Catheters continue to be used acutely and long term in a significant proportion of HD patients. HD catheter care should routinely involve pre-emptive surveillance for emerging access dysfunction (in terms of declining Qb and delivered dialysis dose). Early detection of a failing catheter should permit prompt lytic therapy to salvage the indwelling catheter, thereby avoiding or at least delaying the need for catheter replacement. In patients with a need for frequent lytic therapy, further thrombolysis may not be as effective as sheath disruption. The evaluation of combined antibiotic and antithrombotic locking solutions in prolonging the life of TDCs is ongoing (79,80). Catheters surface-treated with antithrombotic coatings (81) appear to reduce platelet adhesion and thrombus formation on the catheter. However, there is an absence of clinical data confirming a reduction in catheter-related complications (81). Although catheters are not regarded as appropriate for long-term HD delivery, they offer a number of advantages in the acute setting, acting as a bridge to more permanent vascular access, and are useful for patients ineligible for arteriovenous fistula or arteriovenous graft. Indeed, continued improvements in the design and performance of catheters along with poor access preparation before initiation of dialysis suggests that they will continue to be the initial method of access for the majority of patients initiating long-term HD. Attention to monitoring for dysfunction and infection, the two major clinical complications of catheter use, as well as prompt intervention to salvage the functionality of the indwelling catheter, are essential in preventing or minimizing potential morbidity and mortality. Lytic therapy to restore patency after thrombus formation has proven effective. Future studies should focus on evaluating prophylactic use of lytics. Dr. Pandey has no disclosures. Dr. Besarab has been a consultant to Genentech, Inc. in the past and has received honoraria and consulting fees. He has lectured on thrombolytic use and received honoraria from Roche, Canada. Support for some third-party writing assistance for this manuscript was provided by Genentech, Inc. The content of the manuscript was entirely within the control of the authors.